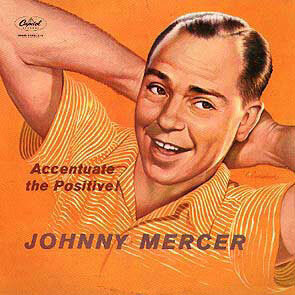 What do Johnny Mercer, Bing Crosby, The Andrews Sisters, Artie Shaw and Kay Kyser have in common? They are recording artists. All scored a Billboard hit with a recording of the collaborative work of Harold Arlen and Johnny Mercer. Can you name that tune? It was Ac-Cent-Tchu-Ate the Positive. Actually, it is impossible to completely “eliminate the negative.” According to Hebrews 9:27, death, which some consider to be the ultimate negative, cannot be eliminated. Also, as Romans chapter three explains, no amount of positive thinking can eliminate the reality of sin’s pervasive and negative presence. As long as our earthly pilgrimage continues, these and other “negatives” will always be ours. Still, we choose whether or not we focus on the negative or accentuate the positive. In fact, we are challenged in James 1:2 to “consider it pure joy” when we face trials of many kinds. These words were originally addressed to persecuted Jewish believers scattered among pagan peoples. It was imperative that they understood their trials were not punishment, a curse, or a divinely orchestrated calamity. To the contrary, they were a reason for rejoicing. Trials should be faced with an attitude of pure (literally, full or unmixed) joy—not just “some joy” coupled with much grief. Talk about accentuating the positive! A constant emphasis on the negative is very destructive. As light beams penetrate and triumph over darkness, the positive has great power over the negative. Preaching which reflects this reality—which points the way to victory over sin and death—is decidedly positive. Such was the point of the Apostle Paul with respect to first century preaching. He said, “For the Son of God, Jesus Christ, who was preached among you by me and Silas and Timothy, was not ‘Yes’ and ‘No,’ but in him it has always been ‘Yes.’ For no matter how many promises God has made, they are ‘Yes’ in Christ. And so through him the ‘Amen’ is spoken by us to the glory of God” (2 Corinthians 1:19-20). Talk about latching on to the affirmative! We have not been through anything as severe as the depression years followed by the war years of the 1930’s and 1940’s. However, our nation and our faith communities have definitely encountered many kinds of trials during the past few years. I am not so naïve as to think the negative can be eliminated, but I hope our faith in God is always such that we can keep gloom down to a minimum and spread joy up to the maximum. Christians cannot deny the fact of death, but we can face it with the positive perspective of hope (1 Thessalonians 4:13-18). We must not ignore the presence of sin, but we can positively declare the praises of Him who called us “out of darkness into His wonderful light” (1 Peter 2:10). Believers in Christ cannot escape the troubles of life, but we can, in view of the positive things they produce in our lives, “consider them pure joy” (James 1:2-4) Indeed, we cannot eliminate evil, but we must endeavor to “overcome evil with good” (Romans 12:21). Beloved, as we share the journey into the heart of God, let’s accentuate the positive!